Welcome to the Spixii Spotlight, a series designed to interview influencers in the InsurTech space. 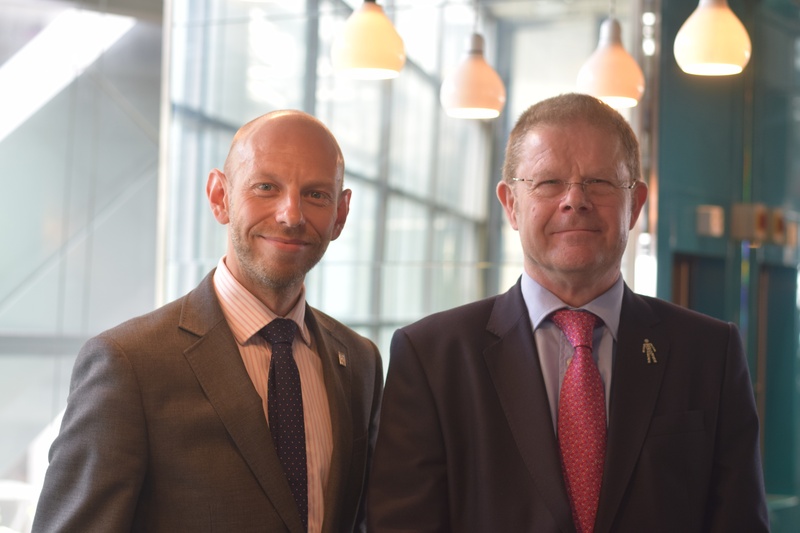 This month, we talk to BIBA's Chief Executive, Steve White, and Head of Corporate Affairs, Andy Thornley, on the issues facing the broking industry and their vision for the future . The British Insurance Brokers' Association (BIBA) is the UK's leading general insurance intermediary organisation, representing the interests of insurance brokers, intermediaries and their customers. Hi Steve and Andy! What are the biggest challenges facing today's brokers? Steve: Brokers are varied, from big multinational firms to small firms operating in towns across the UK. A one-size-fits-all answer is not easy. However, there are recurring themes - for instance, the style and weight of regulation. Research shows the FCA are the most expensive in the world and can be overburdening. First, demonstrate the visibility of the BIBA Executive Team (what I promised when I became CEO five years ago). Secondly, it allows us to explain to members what we do, why we do it, how we do it, as well as the successes we have been having. Thirdly and most importantly, it allows us to listen to members about what their issues are. We take all those issues from those regional tour events and from that, form our annual manifesto. One issue that came across loud and clear on the tour in 2017 was the sheer weight of regulation from the FCA. Prior to the tour, we attended the Conservative party conference in Manchester. There, we heard a number of ministers and senior politicians comment on the productivity of UK business. UK business productivity-wise underperforms against their European peers. We were content that our insurance broking sector is fairly productive, but one of the impediments to productivity is the weight of regulatory actions. In our manifesto, we have the proportionality of regulators as a key issue. We took that issue to Nicky Morgan. Nicky is the chair of the Treasury Committee. She is one of the very few people who can call the CEO of the FCA to account. We made the case to her that our sector is over-regulated. Now don't get us wrong - we have no problem with regulation, we are not calling for lighter regulation. We are calling for the right touch. That is clearly an issue for brokers. Another issue is the changing nature of customers. Customers are becoming more demanding, tech-savvy - they live their lives wanting things now. Brokers are having to react to that in the way they deal with customers, and they are actively looking for solutions on how they can do that. Andy: If you look at the way we are as customers, not just in the insurance but across the board, the way that we buy things is changing. People want things immediately. Brokers - who have been innovators throughout the history of insurance - are changing the way they do that. That is certainly something we want to help with as a trade body. Quite often, we get invited to conferences and one of the questions that gets fired is 'Are brokers dead?" It is amazing how long we have been asked that question. When DirectLine came along - the first true disrupter - all of the talk was 'this is the death of the broker'. When price comparison websites came in? 'This is the death of the broker'. Then when technology came in, 'this is the death of the broker'. I don't think this is going to be the death of the broker. It's a great opportunity for brokers to start engaging. Certainly, one thing BIBA want to do is help make our members aware of technologies and new tools, which can help them become more efficient, serve their customers better, produce cost savings that improves their bottom line, and help them face this threat. Because with any threat, there is also an opportunity. Is this the death of the broker? No. It's a great opportunity. How can brokers engage with insurtech? Steve: Already, we have seen brokers engage in insurtech and that thought process. The BIBA Hackathon was a really good example of showing to brokers real-life problems could be addressed in just 6 hours. The teams came up with some extremely good solutions. Andy: The hackathon was a really important piece for us. We had two aims. The first aim was to enlighten an incumbent audience: to say in 6 hours, we can address your pain-points. All the solutions that came forward were credible - that was a job really well done. On the other side of things, it was to flag up to innovators and insurtech firms that collaboration with the insurance broking market is a viable option. There is a huge market there. 93% of commercial insurance premiums are placed through brokers. If that's something you can tap into, help solve broker problems and work together with them, there can be winners all-round. As well as being a trade body for incumbents, we have a number of tech brokers within our membership. It's certainly not just about helping incumbents get up to speed. We want the sector as a whole to move forward. We are working to enable insurtech firms to either foster collaboration or represent them when it comes to changing the regulatory or legal landscape, which makes things easier to become established or grow into a scaleup and thrive. It's important also to note BIBA is not just a trade body of yesterday's brokers trying to nudge them up in terms of technology. It includes both tech brokers and incumbents. Steve: BIBA is also heavily involved in the young broker space. The demography within brokers is changing. Young brokers tell us their interest is in technology and again, we saw that healthy interest in the hackathon. Converting that interest into action is key. As younger brokers become more senior in firms, they are bringing new eyes to not just how customers are handled but the whole process and steps that go on within the service delivery. That's again where our dating agency plays a really important part in bridging the part. Andy: The diversity of the broking industry's next generation of leaders is important, and something we feel is starting to bear fruit. [At the hackathon], it was fantastic to see diversity in our Young Broker of the Year awards. In fact, our top 3 finalists were all female. At the BIBA conference this year, we had 7,500 attendees, 211 exhibitions ranging from the biggest insurers in the world to tech firms, and for the first time we had the hackathon and innovation space. This was for insurtechs and partners to experience the conference for the first time. As with anything new, it's an iterative process; every year, we look at what we've done and look at how we can do it better for the next time around. If you have a view on what we do and want to shape next year's conference, please do get in touch with us. We do what we do to the best of our ability, but we always want to do better. What is your vision for the broking industry, and what would you say to future generations who inheriting family firms? Steve: Insurance brokers will do what they have always done: mitigate risk and give their customers peace of mind that if the worst happens, they will make sure their customer gets back to the same position they were in before the loss. We are seeing an increased use of technology to deliver that key fundamental. Technology is going to get better I think on risk identification. It's playing a bigger role in mitigation and helping provide peace of mind. This technology is also starting to be applied to helping brokers identify risks for their customers in real-time. Customers sit at the heart of everything we do. Often under agency law, brokers act as an agent for the customer. For the insurance company who basically manufacture the product and brokers who distribute it, they are the key contact-point for the customer. For us, this is really important. We want to maintain a role where brokers are relevant and provide value to customers. Typically, we only touch customers three point in the cycle (inception, renewal and claim time). All three times are not necessarily the best time to speak to a customer. They're either asking for money or when customers have suffered a loss. As an industry, this is something we can improve on. Technology provides an opportunity for ongoing risk management and dialogue with customers. One thing I see in the future is better customer engagement, providing better value - helping brokers stay relevant in the broker market of tomorrow. I was speaking to someone in the industry who had a vision that insurance isn't something that's sold, it's something that's bought. People see a value in that - there is a key difference. When we have a better interaction with our customers, that is when we start to become a partner rather than someone who sells a service.